The Final Round of America’s Favorite Equestrian Is Underway. Vote for Your Favorite! WESTPORT, CT – October 1, 2011 – The results of Round 4 of America’s Favorite Equestrian are in. 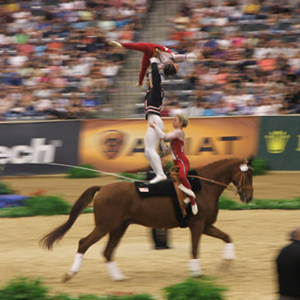 Three equestrians in each of the eight disciplines that participated in the 2010 Alltech FEI World Equestrian Games have moved onto the Final Round. Voting ends on October 31, 2011. America’s Favorite Equestrians will be selected based on the athletes with the highest number of votes recorded in each of the eight disciplines. This is it! Keep Voting! 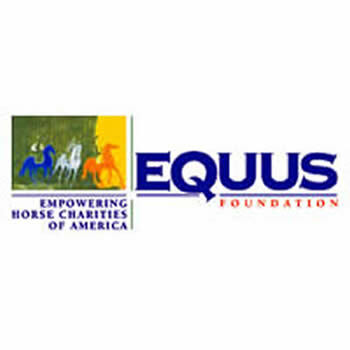 All it takes is a $5 gift to The EQUUS Foundation to insure that your favorite is America’s favorite. Click here to see the equestrian entries and to vote. The Results Are In for Round 3 of America’s Favorite Equestrian! WESTPORT, CT – August 2, 2011 – The results of Round 3 of America’s Favorite Equestrian are in. Four equestrians in each of the eight disciplines that participated in the Alltech FEI World Equestrian Games have moved onto Round 4. Dressage: Debbie McDonald followed by Steffen Peters, Guenter Seidel and Courtney King-Dye. Driving: Chester Weber followed by Tucker Johnson, Rochelle Temple and Suzy Stafford. Endurance: Becky Hart followed by Dave Rabe, Julie Suhr and Bill Wilson. Eventing: Tiana Coudray followed by Boyd Martin, Kimberly Severson and Phillip Dutton. Jumping: Anne Kursinski followed by Beezie Madden, Margie Engle and McLain Ward. Para-Dressage: Jennifer Baker followed by Mary Jordan, Jonathan Wentz and Robin Brueckmann. Reining: Andrea Fappani followed by Tom McCutcheon, Shawn Flarida and Tim McQuay. Vaulting: Megan Benjamin followed by Katherine Wick, Devon Maitozo and Ali Divita. Keep Voting! One more equestrian with the lowest number of votes in each discipline will drop off the list at the end of Round 4 on September 30, 2011. Don’t let it be your favorite! All it takes is a $5 gift to The EQUUS Foundation to keep your favorite in the running for America’s Favorite Equestrian. Visit the link at http://www.equusfoundation.org/vote. For a $5 contribution, you can select your favorite equestrian (listed by discipline) and follow the instructions provided to use mobile texting to vote. After texting your vote, you must reply YES to confirm your vote and $5 donation. Team show jumping medals ceremony. Photo: Sportfot. Lexington, KY – After a week of intense heat and one suspenseful afternoon of strong thunderstorms, the 2011 Adequan/FEI North American Junior & Young Rider Championships presented by Gotham North wrapped up today under sunny skies at the Kentucky Horse Park. The competition in all five disciplines – dressage, endurance, eventing, reining, and show jumping – was intense, and the approximately 250 riders from six countries showed that they had come to win. The first competition to wrap up this year was the inaugural North American Young Rider Endurance Championship. Friday’s 75-mile ride featured both CEI2* and CEI4* divisions. The United States brought home four Gold medals, three Silvers, and two Bronze medals in the endurance competition. In the CEI4* divisions, Team USA took home the Gold after accruing a collective ride time of 25 hours, 25 minutes, and 31 seconds. Individually in the CEI4*, Kelsey Russell and My Wild Irish Gold (USA) took home the Gold, Lindsay Bean and Tektonic (USA) the Silver, and Kyle Gibbon and Missu Koran (USA) the Bronze. Also in the CEI4* division, Tektonic received the Best Conditioned Horse Award. 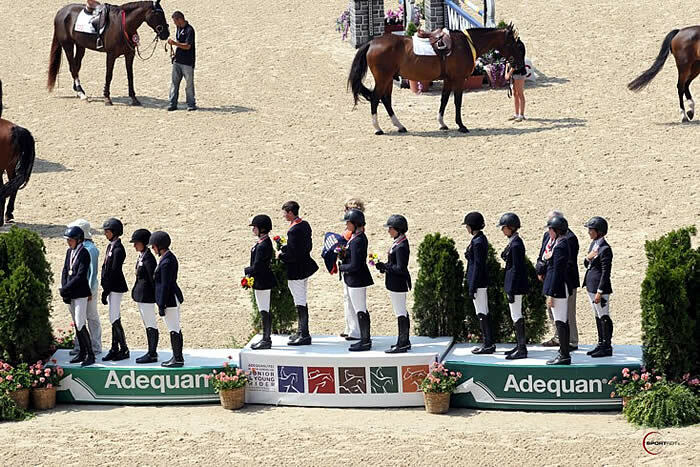 In the CEI2* class, the Team Gold medal was awarded to Team USA Northeast A, whose collective ride time totaled 25 hours, 40 minutes, and 57 seconds. America’s Favorite Equestrian Round 2 Closing on May 31! WESTPORT, CT – May 23, 2011 – One more equestrian with the lowest number of votes in each discipline will drop off the list at the end of Round 2 on May 31, 2011. Don’t let it be your favorite! All it takes is a $5 gift to The EQUUS Foundation to keep your favorite in the competition. Thousand Oaks, CA – March 28, 2011 – In celebration of the eight disciplines competing at the 2010 Alltech FEI World Equestrian Games, The EQUUS Foundation (in partnership with the United States Equestrian Federation) established the America’s Favorite Equestrian program. On March 31, 2011 two Para-Dressage athletes will be eliminated and the top six Para-Dressage riders will move on to round two. 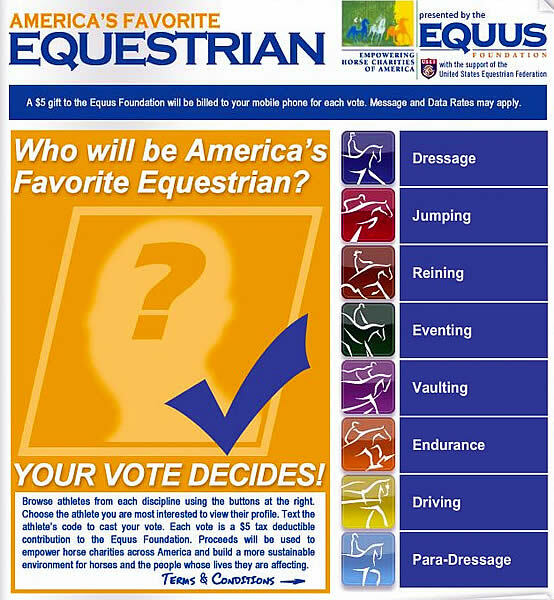 It is up to every person to vote for his or her favorite Para-Equestrian. These are the eight equestrians listed presently with their rider number in parenthesis. Lausanne (SUI), 25 January 2011 – Elizabeth “Liz” Day of South Africa, Deputy Chair of Geographical Group IX, international judge in Dressage, Eventing and Para Dressage, and member of the management committee of the South African National Equestrian Federation (SANEF), passed away just before Christmas after losing her courageous battle against cancer. Her many friends will miss her energy, passion, wise advice, tolerant attitude and sense of humour. Liz was British born but spent most of her adult life in South Africa. An accountant by profession, she connected with horses at an early age and Dressage became her passion. As a rider, she won the KZN Medium Championships on a Basuto/Thoroughbred pony and recalled this as one of her greatest triumphs. WESTPORT, CT – December 17, 2010 – America’s Favorite Equestrian is an interactive fundraising effort presented jointly in partnership by The EQUUS Foundation and The United States Equestrian Federation (USEF) to raise funds to advance the equestrian sport on an annual basis. 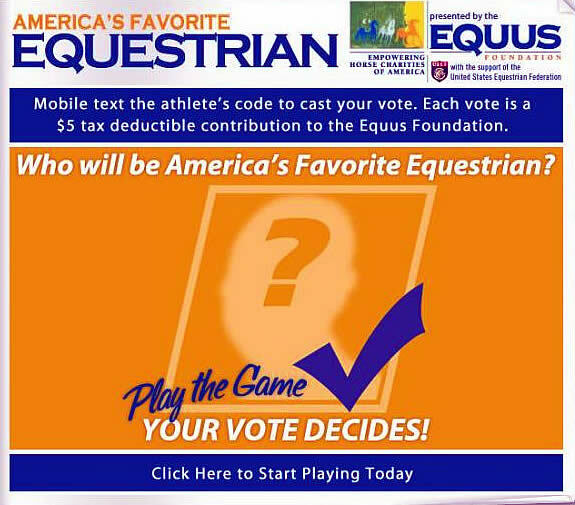 Using mobile texting, you can vote to select America’s Favorite Equestrians and support The EQUUS Foundation with a $5 gift. 100% of all donations will be used to support charitable causes. A minimum of $10,000 in “sport welfare” grants will be awarded, with an additional $5,000 grant awarded to the equestrian discipline generating the most votes. The objective is for the America’s Favorite Equestrians to be an ongoing program with all equestrian disciplines/breeds represented and the winners recognized in a permanent “Hall of Fame”. The original intent was to launch the inaugural program in conjunction with the World Equestrian Games, which is why initially the eight disciplines of dressage, driving, endurance, eventing, jumping, para-dressage, reining, and vaulting were selected. The affiliates of the United States Equestrian Federation representing these disciplines selected the equestrians. But, there were some logistics involved in establishing the mobile texting system and developing the website, which delayed the launch until December. Randy is the newest addition to the incredible group of horses at Vinceremos Therapeutic Riding Center. Photo Courtesy of the VTRC. Loxahatchee, FL – October 21, 2010 – Recently, international grand prix rider Lauren Hough donated the mount Aspirant “Randy” to the Vinceremos Therapeutic Riding Center (VTRC). After suffering some health issues, Randy was unable hold up to the rigors of life as a show horse. Hough has always been a supporter of the work at VTRC and felt that Randy’s gentle nature would make him perfect for a new career helping those with disabilities. Randy is a 10-year-old Holsteiner gelding who has become the perfect horse for therapy. His gentle nature and “knowing” sense combined with his incredible movement that is therapeutic for many riders have made him very successful. While his manner outside of the ring is sometimes playful, he always knows how to be very careful with his riders. Susan Treabess and Moneypenny placed 10th representing the United States during the Freestyle competition for Para-Dressage. Photo © 2010 Lauren R. Giannini. Lexington, KY – October 11, 2010 – Wow describes the quality of the routines, the variety of the music, the ambition and the talent displayed in the Freestyle competition of the first-ever Para-Dressage championships staged during the Alltech FEI World Equestrian Games at Kentucky Horse Park. The five Freestyle classes took place during the last three days of the Games, with the medal ceremony for all grades taking place around noon on Sunday. Grade III para-riders put on their dancing shoes Friday morning with Hannelore Brenner (GER) adding more gold to her collection. In the afternoon Emma Shearborn (GBR) and Purdy’s Dream harvested gold in Grade Ia. Saturday morning competitors classified Grade II kicked off the restraints of standardized FEI para-tests with Dr. Angelika Trabert (GER) partnering with Ariva-Avanti to capture the gold by .05 over Gert Vollmer (NED) and Triumph who scored 75.850. Great Britain’s Jo Pitt claimed the bronze, scoring 74.950 with Estralita. Daily radio coverage of the 2010 Alltech FEI World Equestrian Games continues with a wrap up of the day’s events. We recap the Jumping Rolex Top Four results, Para Dressage Individual Freestyle, Combined Driving Obstacles final results, Vaulting Freestyle Team Finals competition today as we record at the International Equestrian Festival in front of a live audience. Listen in. Location: The International Equestrian Festival in downtown Lexington. Recording at 7:00 PM every night. Stop down and join us. Coverage: Follow all the coverage of the 2010 Alltech FEI World Equestrian Games on the Horse Radio Network.